Blend it Up … and get Free Shipping! 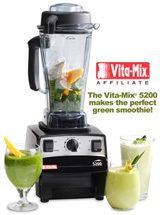 I am now an official Vita-Mix affiliate! If you have been considering purchasing a new Vita-Mix, PLEASE purchase it using my affiliate code. This code also entitles you to free standard ground shipping (a $25 savings in the U.S. / $35 savings in Canada). Just click on the image below and my codes will be automatically registered! Did you get a Vita-mix????!!! !